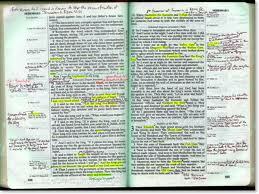 I love to see the pages in a believer’s Bible marked up with notes in the margins, brackets around words, underlining beneath sentences, various shades of highlighter, and symbols that draw attention to specific categories of truth. It shows me that the person is doing more than letting his eyes float across the words on the page; it shows me that the person is meditating on Scripture. We mark up our Bibles because it helps us… it helps us think deeply about God, it helps us remember his promises, it helps us reference specific verses more easily. These are all great reasons to take the time and energy to interrupt the cleanly organized black and white of a Bible page with your pens and highlighters. But let me suggest to you another reason why you should mark up your Bible that’s not so much about you. Make the effort to mark up your Bible for the person who you will give it to after you’re done with it. Many of us want to keep our old Bibles on the shelf for nostalgic reasons or in case we want to reference something, but think about the value it could have in the hands of a younger Christian in your church or a Christian who is not as spiritually mature. Your markings and notes would become for these people a personal tutor to help them read and study the Bible. Your markings can help them know what to look for in the text and your notes can draw out meaning and application. It may be that they will not understand everything you have marked or noted, but there is no doubt they will be guided on their journey through the Word. You could just give a study Bible to a younger Christian in your life, but the advantage of giving your Bible to them is that they know you and have learned to trust you. This adds a strong dynamic to their study of the Bible, plus if there’s anything that you’ve marked that they don’t understand you can make yourself available for questions anytime. In doing this, the blessings you experience in the Word can become the blessings of someone else as well. This entry was posted on Friday, April 6th, 2012 at 10:24 am	and tagged with Discipleship, Marking Up Your Bible and posted in Bible Study, Christian Growth, Discipleship. You can follow any responses to this entry through the RSS 2.0 feed.